As we come to our annual Labor Day Holiday, let's review the advice of Thomas Friedman, who has opined that "average is over." The picture is from a report on a speech he gave in Sacramento, California that made just this point. The online news source AlterNet has published an article that deconstructs this pronouncement, and that concludes that Friedman is actually saying that we now live in a world in which you must be "above average" to get a good job. Whether we think of average as the "mean" or as the "median," that leaves a lot of people out. And Friedman seems to think that this is actually a "good thing." It's more or less the same idea that motivates a claim that our newly "naked economy" brings "benefits." Our current economy does bring benefits (though maybe mostly, or only, to the "above average" workers). Query how much of a benefit that truly is. 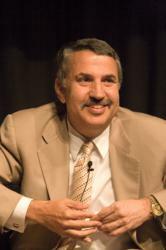 The AlterNet article is titled "Why Tom Friedman Is the Ayn Rand of Our Times." It is worth reading. To restate my feelings, I am not a big Ayn Rand fan. The ruthless individualism that she promoted, and that Friedman flirts with, is not our route to a better society. On Labor Day, tomorrow, I hope any persons reading this will ponder that question for themselves. The "Average is Over" concept is not what Labor Day is about, anyway, and that's for sure!